These are the Pyramids of Giza in Egypt. This started life as a very flat image with a low dynamic range. To bring it to life I developed it in the cameras own raw developer with a tone curve and in Photomatix to produce an HDR image. I blended the two in Photoshop taking the best bits from each image. Interestingly the HDR image had extra pixels round every edge so it had a higher pixel count than the cameras own software. This image has been accepted by Dreamstime for Stock Photography and is available for download here. 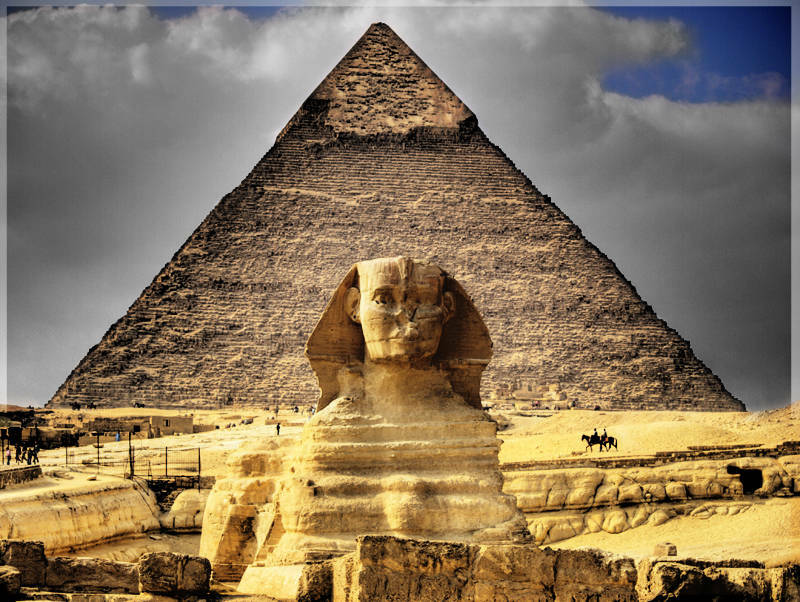 I like the look of the photo but there seems to be a masking effect along the edge of the pyramid. Or is this another effect? Its a bit of both. When you push an HDR too far without enough light smoothing it has the effect of darkening the edge of buildings and brightening the sky around them. There is also a desaturation mask along the edge of the pyramid to remove the colour from the clouds. Amazing shot, well done, superb lights, i love it ! My vote for you on Coolphotoblog. Bravo from France. Thanks Olivier. You have a great photoblog too. I will return the favour on Coolphotoblogs.